Shinique Smith, Forgiving Strands, 2015–16. Installation view. Photo: Brian Forrest. HAUSER WIRTH & SCHIMMEL’S first Los Angeles exhibition builds off of two rolling, wavelike ideas. The first traces a tradition of expressiveness, materiality, and the handmade in what the curators call the “studio-based” practice of twentieth- and twenty-first-century sculpture. The second nests these ideas about abstraction and the sculptural in an emphatically feminist argument, one that asserts that the production, display, and reception of such art has been shaped by the personhood of the artists who tended to practice it, and by the sexist social and institutional conditions those individuals faced under modernism. Repeating a 1970s-era tradition of feminist exhibition-makingone that is as entangled in debate as the long modernist tradition and its claims, critiques, and counterclaims about the studio“Revolution in the Making: Abstract Sculpture by Women, 1947–2016” assembles thirty-four artists who were in each case selected for their work, but were also selected for being artists who are women. I can’t help but hear this unapologetic embrace of sexual difference as what Eve Kosofsky Sedgwick would have called the “bad news [that must] be always already known”which is to say, a comforting pessimism that serves only to perpetuate a retrograde status quo. Why are we so hung up on these biologically sanctioned social relations? What ideas do they uphold about gender and women, bodies and normalcy, work and the studio, public and private life? The show could have been mounted just the same with artists who are male or artists who identify in other ways, or it could have drawn equally from the same artists without claiming that a gendered “female sensibility” informs their practicethey’re simply thirty-four artists the curators selected, for reasons to do with their work and its models and ideas. Also overlooked in favor of an “empowering,” identity-based approach is a radical feminist tradition of negatively structured genealogy, which, through a rejection of patriarchy, foregrounds the transmission of knowledge through matrilineal connnections. It would have been meaningful to see the work of such artists as Gedi Sibony and Rodney McMillian in this exhibition for the ways in which those artistswho, if you must know, are mendraw out novel expressive modes associated with feminist practice in their art. What the show wants to call “female sensibility” is multiple, as masculine or queer as it is feminine, and it is also contradictory, since identifying with the feminine can be disempowering for all. Gender debates aside, “Revolution in the Making” is a wish list, a checklist, a tactile, textured art-historical lineup of abstract sculpture writ into space. Impressive in its expansiveness and historical imagination, the show is also a consummately hybrid product: Conceived by Paul Schimmel, a distinguished curator whose career spans the mid-’70s to the present, and Jenni Sorkin, an accomplished scholar and curator currently teaching at the University of California, Santa Barbara, the show is research-driven, with a substantial publication including essays by Sorkin, Elizabeth A. T. Smith, and Anne M. Wagner, yet carried out in a for-profit venue, a gallerywhere Schimmel is now partner and vice presidentthat is one of the contemporary art world’s most influential global entities. To realize the show, the curators secured dozens of loans from leading museums and private collections in the US and many other countries; the lenders list is more extensive than that of most large-scale contemporary museum exhibitions. (It is worth noting that only eight Hauser & Wirth artists can be found among the artists on view, and that amid the nearly one hundred works in the show, less than 20 percent are available for sale.) “Revolution in the Making” also has an institutional precedent: Hauser Wirth & Schimmel is just walking distance from the Museum of Contemporary Art’s first building of the early 1980s, the Geffen Contemporary at MoCA, and its proximity prompts visceral memories of the 2007 exhibition “WACK! Art and the Feminist Revolution,” which Connie Butler curated under Schimmel, who was then LA MoCA’s chief curator, and to which Sorkin contributed in a research role. View of “Revolution in the Making: Abstract Sculpture by Women, 1947–2016,” 2016. Background: Eva Hesse, Aught, 1968. 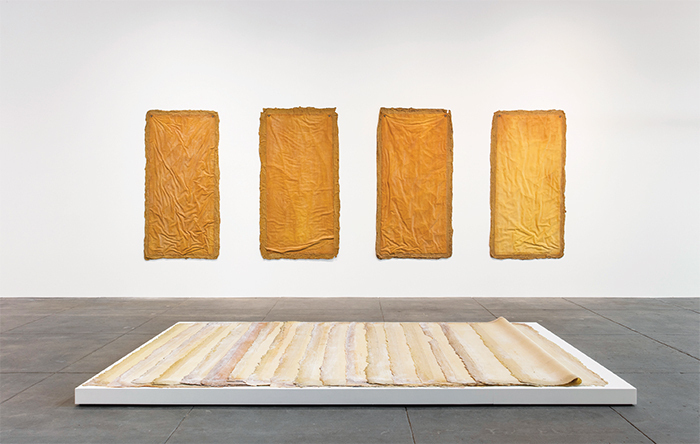 Foreground: Eva Hesse, Augment, 1968. Photo: Brian Forrest. THE HYBRIDITY of “Revolution in the Making” is also informed by the quality and character of Hauser Wirth & Schimmel’s exhibition space, a renovated complex of roughly one-hundred-year-old buildings that once served as a flour factory. Installed here, artworks are invested with an aura, the aura of being situated in a newly refurbished structure, one located near train tracks once used for the transport of early-twentieth-century-LA foodstuffs, and in a neighborhood of downtown LA that is now remaking itself as an early-twenty-first-century art and residential corridor. This context inflects their meaning, as artwork and building make contact throughout the exhibition. By looking closely at the spatial and contextual aspects of the curation, we can identify the aims submerged in the show: to restage works as they appeared in historical exhibitions, to do so faithfully, and to make an “art” of locating work in this repurposed building. In the open-air courtyard, the gallery’s largest single space, is 30 to 1 Bound Trees by Jackie Winsor, which Winsor first executed at Nova Scotia College of Art and Design in 1971–72 (the piece was soon destroyed). Recreated here, the work features young birch saplings wound with hemp rope and oriented upright, with a warm, golden binding at the center that brings them together in a single column; it is a post-Minimal, organic, Tatlin’s Tower–like counterpoint to the gallery complex. From the courtyard, I find a passageway where I can use my feet and eyes to move clear through the gallery’s building from Third to Second Street. This breezeway now serves as a container for Shinique Smith’s Forgiving Strands, 2015–16. 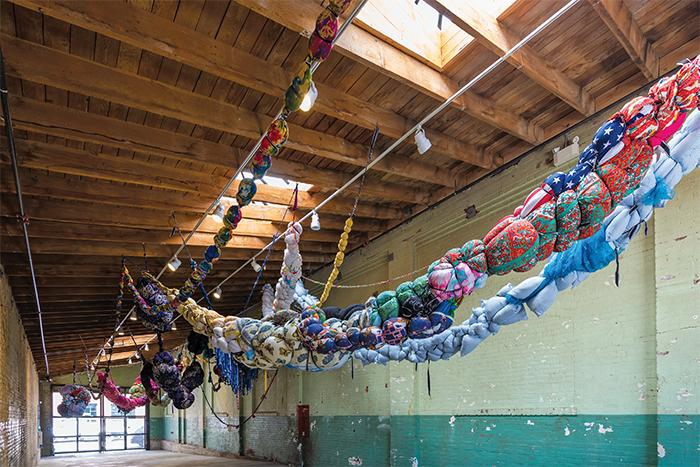 Multicolored and patterned, snake- and spiral-like, made by binding, tying, collecting, and combining all manner of fabric, scraps, and goods, Smith’s sprawling sculpture serves as a sign of generosity, announcing the public’s apparently open access to the gallery. Beneath a freshly refurbished skylight in the sunlit south galleryit once housed an administrative center and an employee banksix Lee Bontecous bring their dark intensity to a display of four other artists: Ruth Asawa, Louise Bourgeois, Louise Nevelson, and Claire Falkenstein. The Nevelson piece, Sky Cathedral/Southern Mountain, 1959, which was borrowed from LA MoCA, is installed somewhat differently than these other works, directly on the floor in a portion of the room where the ceiling is lower.It looks consistent with similar Nevelsons I viewed at Pace Gallery or the Jewish Museum in New York during the ’80s and ’90s, before the advent of the enormity of scale that typifies so many of the new exhibition spaces of today. 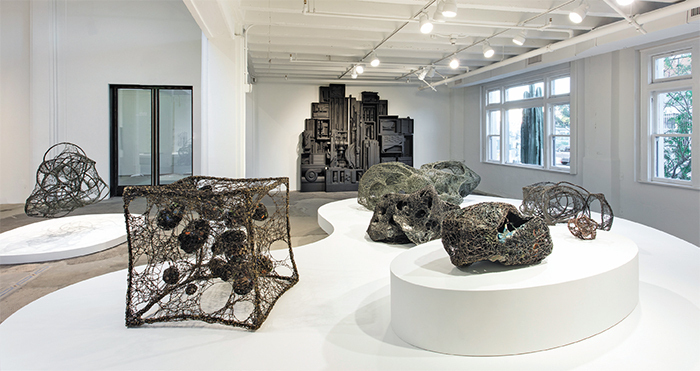 View of “Revolution in the Making: Abstract Sculpture by Women, 1947–2016,” 2016. Background: Louise Nevelson, Sky Cathedral/Southern Mountain, 1959. Floor and foreground: Works by Claire Falkenstein. Photo: Brian Forrest. IF THE LOW-CEILINGED DISPLAY and domestic scale of the Nevelson leaves a feeling of anachronism, it may not be the only one produced by this show: There is also the show’s seeming division between abstraction and art objects that engage direct social and political thinking in the everyday realm. But I am of two minds about the ways the show mobilizes abstraction. At its best, the notion of the studio-based and the handmade that this show seeks to explore can both reformulate and retool the dualism of formalism/politics. 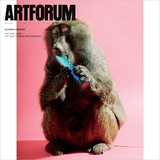 Indeed, it has in the past: This formalist-leaning, or materialist, exhibition is not actually out of step with antiformalist positions that emerged in the ’70s and ’80s or with political traditions in art that characterized the same period. The answers about what art practice did to these approaches are here in abundance in works by Karla Black, Abigail DeVille, Rachel Khedoori, and Kaari Upson. The show works on me as I view it; it schools me. Projecting from the corner and piercing the dualism of male/female, there is a breathtaking Senga Nengudi, R.S.V.P. Reverie-O, 2015, the only object in the exhibition that links directly to performance. In the past, Nengudi has activated works like these, enacting rituals about the lives of men and women and the blocked (and unblocked) energies between them. This is real sculpture, real meaning: The work’s sand-filled nylons stretch and hold their tensile shape in vividly body-like ways. The revelation that a tapestry lies behind the arced plane of Cristina Iglesias’s cement-and-iron Untitled, 1993–97, is also a revelation about abstraction and its existence in the world. To apprehend Reticule, 1999, a cast-polyurethane structure by Liz Larner, is to see the ways in which color and the properties of the casting process exceed the hermetically abstract: The joints and seams of this work are the stuff of the quotidian world of consumption and production. Works by Iglesias and Larner bring to mind Rachel Harrison, whose efforts to explode the polarity of representation and abstraction have long sustained the trajectory of her practice. Viewing “Revolution in the Making,” like viewing “WACK!,” is a matter of taking in a production whose sense and structure are rooted in the formal and phenomenal qualities of art objects. Being in proximity with Falkenstein’s wire works, some fused with glass, some incorporating iron and gold, or Marisa Merz’s vigorous and delicate Untitled, 1980, consisting of layered triangular swaths of knitted wire, I see now with opened, pluralistic eyes. These works and others, such as three stunners by Jessica Stockholder from the series “Kissing the Wall,” 1988–90, with their laugh-out-loud gesture-forms, appended lights, and fake Christmas tree, are reason enough for one to think of Schimmel and Sorkin’s exhibition as a historically conscious space for fostering the learning and personal growth of public audiences: a gallery-educational complex. “Revolution in the Making: Abstract Sculpture by Women, 1947–2016” is on view at Hauser Wirth & Schimmel through Sept. 4. Rhea Anastas is an art historian who teaches in the department of art at the University of California, Irvine, and is one of the founding members of Orchard, an experimental artist-run gallery in New York (2005–2008).